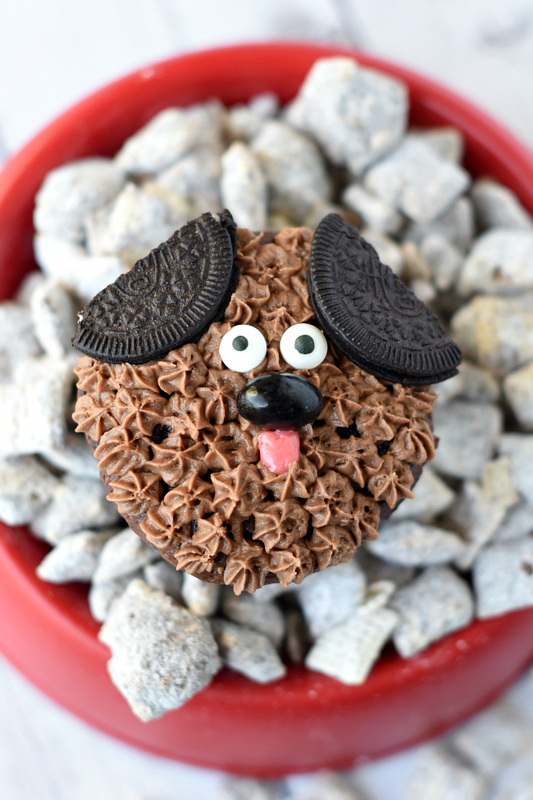 A Peek at the Fun: These puppy cupcakes are easy to make and perfect for a kid’s birthday party! 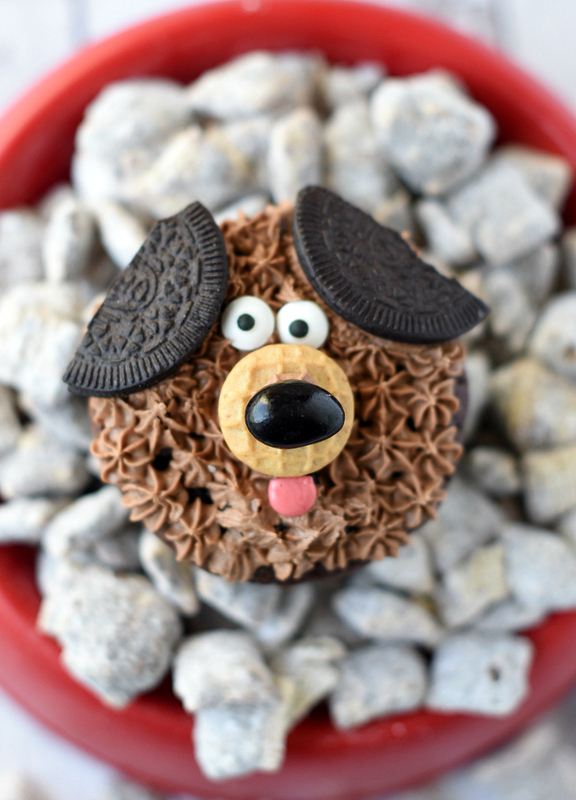 Decorate each cute little puppy dog cupcake with candy, cute eyes and fun frosting and you’ve got a perfect treat to make the birthday kid smile! My (this is Amber) freckle-faced, squishy cheeked baby turned 6 last week, in spite of me insisting he stop growing up. Time is slipping through my fingers and there doesn’t seem to be anything I can do to slow it down. Sometimes it’s hard to make time to enjoy the little moments with him because his older brothers have me so busy running them to practices, overseeing their homework and picking up their stinky socks.I don’t want to miss the little, sweet moments of his childhood! 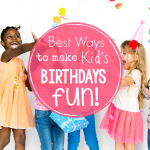 I don’t want to miss the little, sweet moments of my youngest’s childhood, but with his birthday coming up I realized he had missed a special moment of childhood! When my older kids were little, I used to make them really cool, fancy cakes. Whatever they could dream up, I would make it! I did a tiger, I did Elmo, I did a spaceship and a whole mountain with a train driving on it. (Not professional by any means, but my kids loved them.) 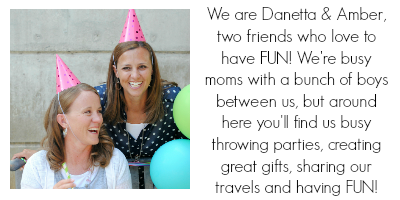 But with my littlest, I feel like I sometimes take the easier route because, you know, after 14 years of birthdays, I am tired. When that cute freckled face looked up and me and told me he wanted a puppy party for his birthday this year, I knew I needed to create a least a little bit of magic. 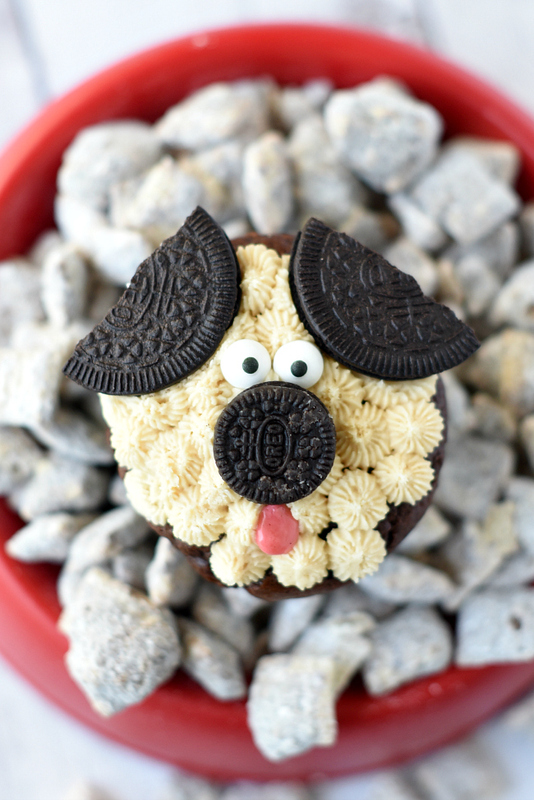 These simple puppy cupcakes impressed him (and his friends), but they were easy for me to create! I wasn’t sure when I started how it would go-I just grabbed a bunch of supplies and started playing around-and I am thrilled with the results. And when he jumped up and down when he saw them, a huge grin on his face, I knew I had captured that magical moment I was looking for. 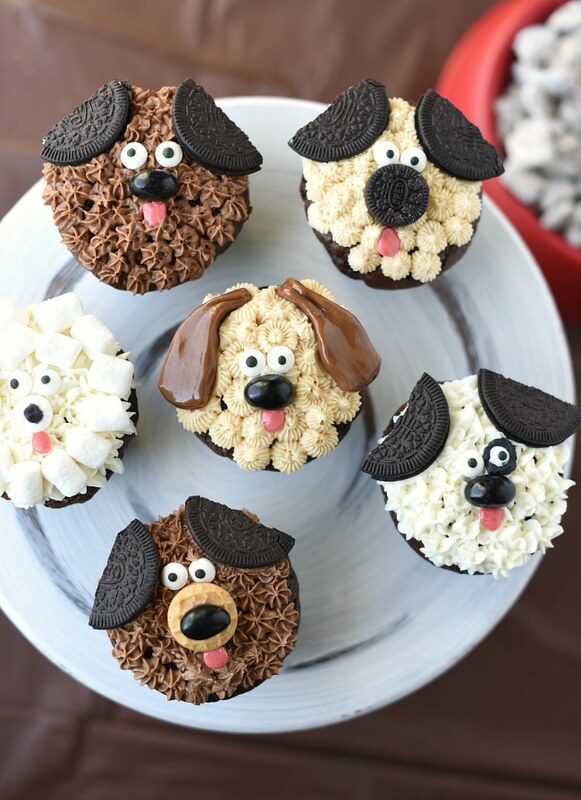 I’ll walk you through how to make each of these puppy cupcakes and then you can try your hand at whatever you want! 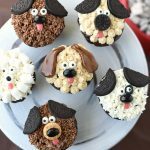 These cute Puppy Cupcakes will bring a smile to any puppy lover’s face and they are easy to make. 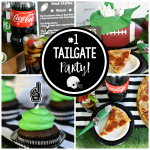 Great for a kid’s birthday party! Start decorating! Really, there’s not a lot of rhyme or reason to this-just do what you think would look cute! Play around with it a little bit. I used the Wilton bags and tips and just tried piping little stars and things to give it depth. This was only my second time doing this, so you certainly don’t have to be a professional for it! 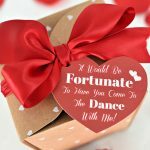 Really, if you have other creative ideas, go for it! Those are just the things I ended up using for these ones. 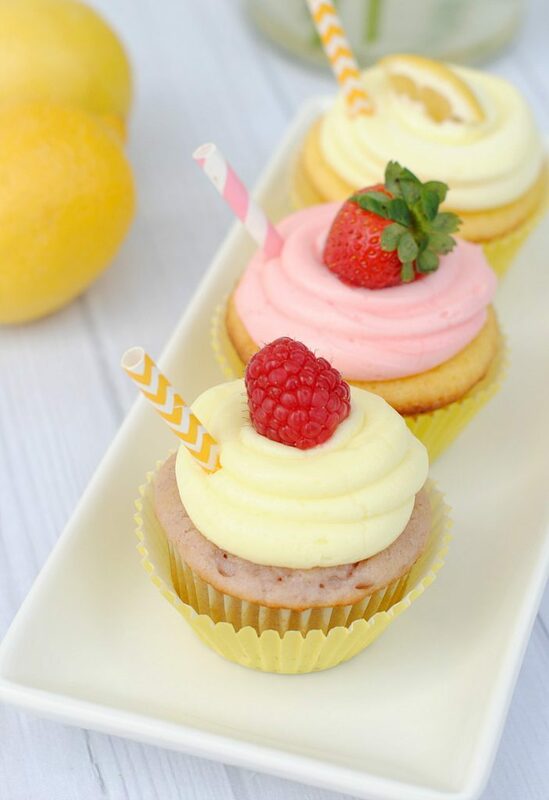 I just used a variety of star-shaped tips to frost these and just piped it all over the top of the cupcake. Then you need to move quickly to add the details before the frosting hardens. This little guy was my favorite, so let’s start with him. 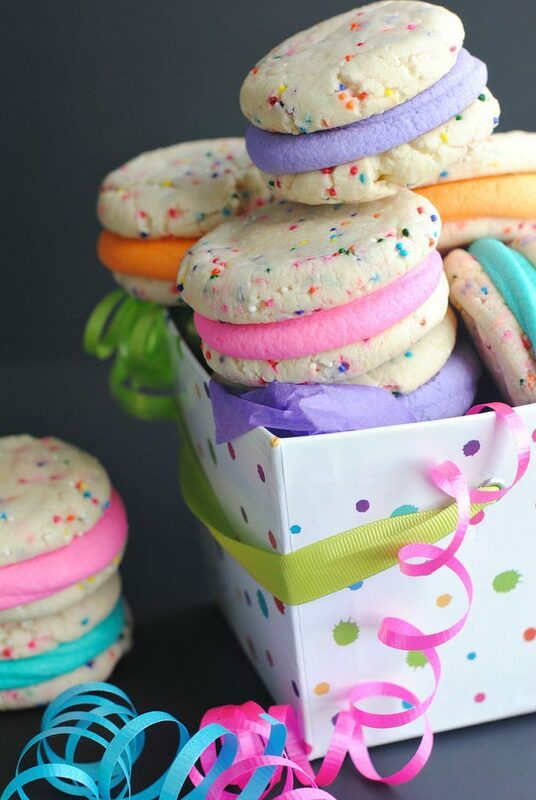 To make this one I used the peanut butter frosting (recipe below) and piped it with a star tip. The ears are tootsie rolls and I used my hands to shape them as ears. Add the eyes, a black jelly bean for the nose, and use a tiny piece of pink candy to make the tongue and you are all set! This guy is cute (though we debated if he looks too much like a bear). Chocolate frosting, Oreo ears, Nutter Butter Mini snout with a black jelly bean nose and a little tongue. And of course, the eyes and he’s done! This guy is similar to the last but I used an Oreo mini for the snout and no jelly bean this time. 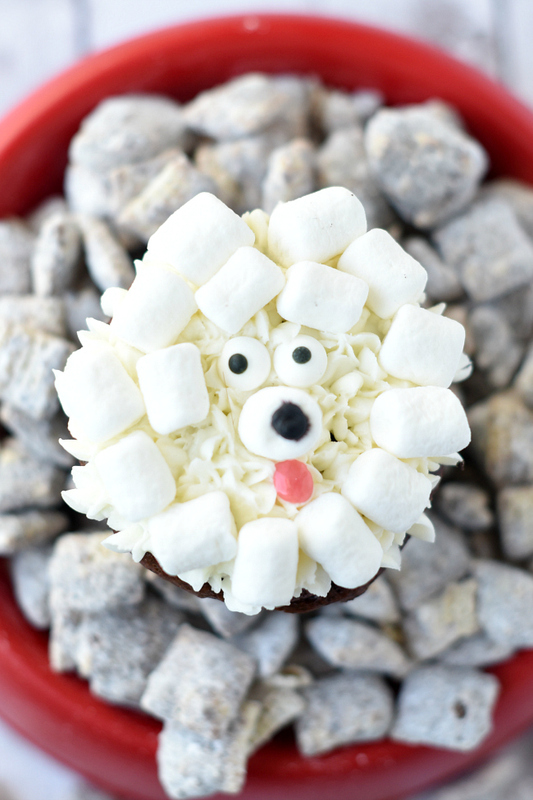 This little poodle cupcake was a surprisingly big hit amongst the little boys! For this one, I used marshmallows and a little bit of the black icing for the nose. That same black icing made this guy’s eye patch. Test that and see how the consistency is. If it’s too thick, add a little milk, too runny, add a little powdered sugar. Then, for peanut butter add 1 C peanut butter. For chocolate add about 1/2 C cocoa powder. 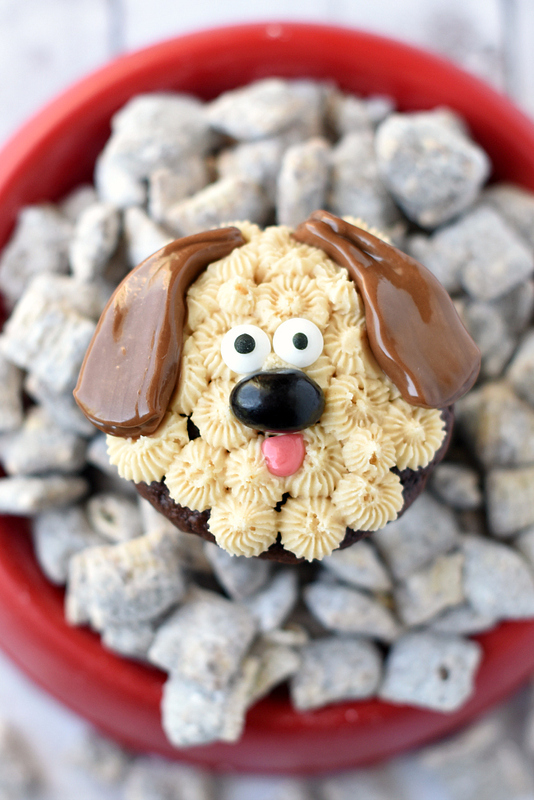 When I walked into the trampoline gym where we celebrated my 6-year-old’s birthday and the kids excitedly pointed out which puppy cupcake they wanted, I know they were a hit. When the two ladies passing by asked me where I got them, I felt like a celebrity. But mostly, I am thrilled that my son will have this fun memory to carry with him as he grows up. 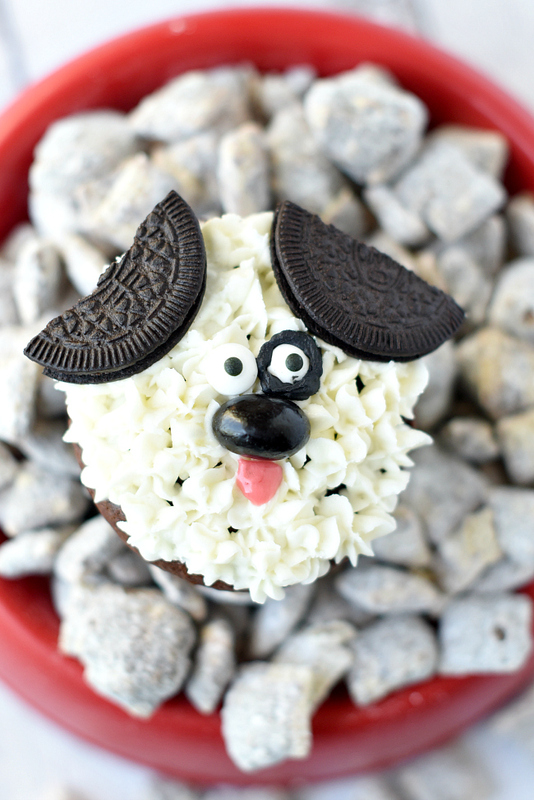 Have FUN making these puppy cupcakes!